A walk-in walk-out treatment option for most patients. Considered the gold standard treatment for long straight veins by vein experts around the world. Endovenous Laser Ablation is a Varicose Veins Laser Treatment performed in our clinic under local anaesthetic. This new procedure is a suitable treatment option for patients with symptoms associated with varicose veins and is considered as effective as surgery but without the need for hospitalisation. Risks and benefits will be discussed during your first consultation. Laser vein therapy is a highly effective technique for dealing with venous reflux. Venous reflux refers to the failure of the valves inside the veins deep in the leg to pump blood properly towards the heart. Left untreated, venous reflux can lead to bulging veins on the surface of the skin, and to even more serious medical problems later on. Fortunately, thanks to modern ultrasound technology and improved diagnostic accuracy, at The Vein Institute we can now treat venous reflux effectively and permanently with endovenous laser ablation (EVLA). 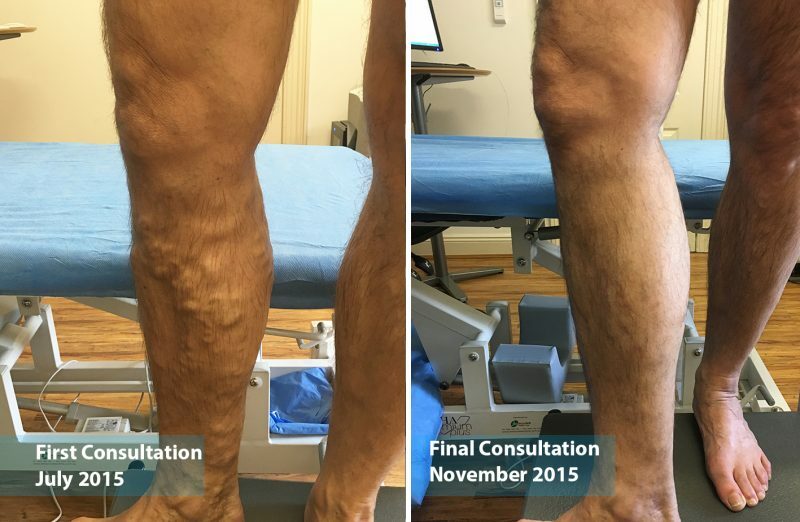 Why do we practice EVLA at The Vein Institute? It is a convenient, “walk in, walk out” procedure, which means there is no hospital stay and no general anaesthetics used. What is a Venous Duplex Ultrasound Scan? Before initiating any laser vein therapy, we start with the “gold standard” of diagnostic tools, a professional venous duplex ultrasound scan of your legs and the veins inside them. This scan helps us determine the cause of your veins, which will, in turn, help us select the most appropriate and effective varicose veins laser treatment. Before the availability of ultrasound, doctors could only base their decisions on what veins to treat on what they could see with their eyes. Now, we can “see” the veins deep beneath the skin and ensure that every vein that needs treatment, gets treatment. This has led to a phenomenal success rate with EVLA. EVLA is comfortable for patients because it is performed right in our clinic, with just local anaesthetics. A very thin laser filament is inserted into the diseased vein and with the help of ultrasound, we can guide the varicose veins laser to precisely the right spot to seal the vein shut permanently. Once the vein is sealed shut, the body begins to reabsorb it while at the same time redirecting the blood flow to healthier veins in the area. In this way, your circulation improves and your appearance improves as the sealed vein gradually fades away over a period of a few weeks. The procedure is pain-free and takes about an hour, after which you can return home or work. There may be some numbness in the leg area until the local anaesthetic wears off. Your doctor will ask you to wear elastic compression stockings on the treated legs to help ensure the vein stays shut and to speed the healing process. If you experience any soreness at all, over the counter painkillers such as panadol will relieve it. One to two weeks later, you will have a follow-up appointment to ensure that the laser vein therapy was completely successful in sealing shut all diseased veins. If any smaller veins need treating, we can use another technique, known as ultrasound-guided sclerotherapy, to seal those shut and perfect the health and beauty of the legs. Can be performed at a clinic (no hospitalisation). No downtime or time away from work usually. Considered safer than surgery with a low risk profile. A detailed ultrasound scan will be used to highlight leaking veins during your consultation. If treatment is necessary and after counselling, local anaesthetic is applied before a laser fibre is used to seal your varicose veins. A soft bandage is then used until your next visit to help keep sealed your treated vein and minimise soreness. Large varicose veins in right leg. Counselling, vascular scan, endovenous laser ablation and 3 foam sclerotherapy sessions. Have questions about Medical Superglue treatment? After your scan at our clinic your leg will be cleaned before a tiny amount of anaesthetic is applied (using super fine needles). Access to your faulty vein will then occur before the laser fibre is inserted. After this a cool anaesthetic is then applied around your vein to protect surrounding tissues. You will then be required to wear goggles before the laser machine is switched on. During the procedure the laser will be pulled back to seal the faulty vein. Rarely will patients experience any discomfort when the laser is being used. After the procedure you will be required to wear stockings for 5-7 days and walk half an hour a day. Long distance travel is not permitted for 4 weeks. Your leg may feel numb for six hours after the procedure. A follow-up appointment is required for all patients. At this appointment further treatment may occur with ultrasound guided sclerotherapy. How does Endovenous Laser Ablation work? In this procedure the laser energy closes the vein wall and seals of the faulty vein. The closed vein eventually disappears as the body reabsorbs it over time. How does blood get back to the heart if the vein is damaged? Varicose veins do not pump blood effectively to the heart so they are not responsible for your circulation. In any case blood finds its way to the heart using other veins. Are there different laser types? There are many different laser types each with their own specific uses. The Vein Institute uses the latest radial tip laser fibres which are associated with less pain after the procedure than traditional bare tip laser fibres. Do I need to prepaer for the procedure? No preparation is required before the procedure. Please make sure you have breakfast if you are having the procedure performed in the morning. Can I drive after the procedure and what must I do? Yes you can drive after the procedure, if you have consumed any Valium. No long distance travel greater than 5 hours is recommended. If this is necessary you are required to have an injection of Clexane. All patients must wear stockings for a minimum of three days after the procedure. All patients must have a review scan after the procedure between 1-2 weeks from the date of laser treatment. What are the possible complications of Endoveous Laser Ablation? Uncommon: Soreness or phlebitis which usually settles with Nurofen and tight compression stockings. Very Very Rare: Nerve damage which affects sensation in calf can extremely rarely occur.